We have been trying to line up lots of fun activities we can do in advance of Valentine’s Day! Valentine’s Day is one of our favorite holidays because everything is cute in it’s pink, red and white with lots of hearts! Since the holiday falls in the middle of winter (which means cold weather and snow on the ground here in Minnesota) it also means we have lots more “indoor time” to fill with fun Valentine activities. 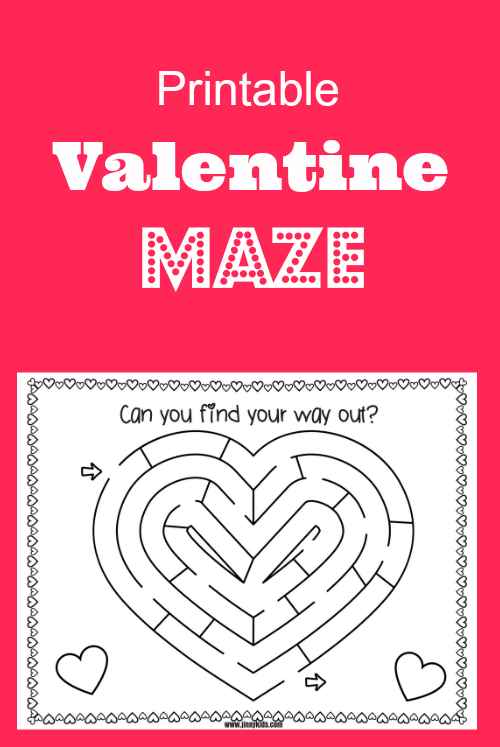 Today we are sharing this printable Valentine Maze! Just print out the maze HERE and let your kids can use a pencil, crayon or marker to find their way through the maze, starting at the “in” arrow and ending at the “exit” arrow. Once they have found their way, they can color in their heart maze. If you’re looking for more fun Valentine’s Day crafts, activities and printables, you can see our whole list HERE. My kids would love to do the printable Valentines! They look fun to do and a good activity to keep them busy! What a fun printable, the kids would enjoy this! Thank you for providing this beautiful printable. My niece will love this coming up on the weekend. Printables like this are so fun to have. This is such a cute, fun little activity for kids! I love it! This is a great printable that my grandsons would love to complete! This would be cute for Valentines Day. I printed these out and they were a big hit. Thanks. I know I’m a day late in printing but my girls will enjoy these. They love hearts and the color pink! 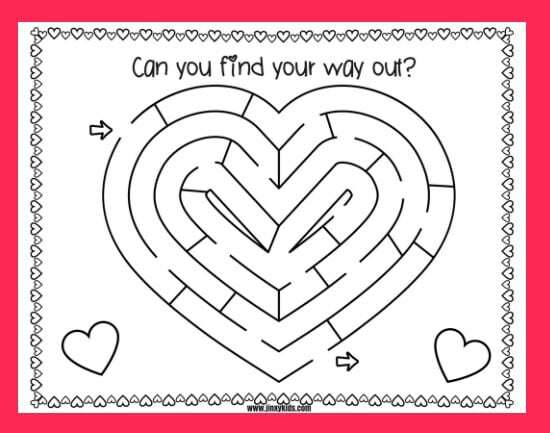 Thanks for sharing this fun maze printable. My grandsons will love it. I see you posted this a year ago and I used it. Thanks again. Thanks for the printable. I love valentine’s day and love. This is too cute. Asia shackelford I love it I want to have a great. My family loves doing fun mazes like this. Thanks for sharing. We love doing things like this. This maze looks like alot of fun. I look forward to doing it later today. Thanks for sharing. I loved doing mazes as a little girl. This is adorable. We need one for Easter. My grandsons would enjoy the challenge of completing this maze! This would be a fun activity for my grandchildren to do on Valentine’s Day. Thanks for sharing! How fun! I’ll have to print this out for the kids for Valentine’s Day! We did mazes for my 5 yo’s class and they were a hit! I’m kicking myself that I didn’t see these sooner.